“Why I am Hindu?” presented me with a partial opportunity to gauge Hinduism of the Congress. 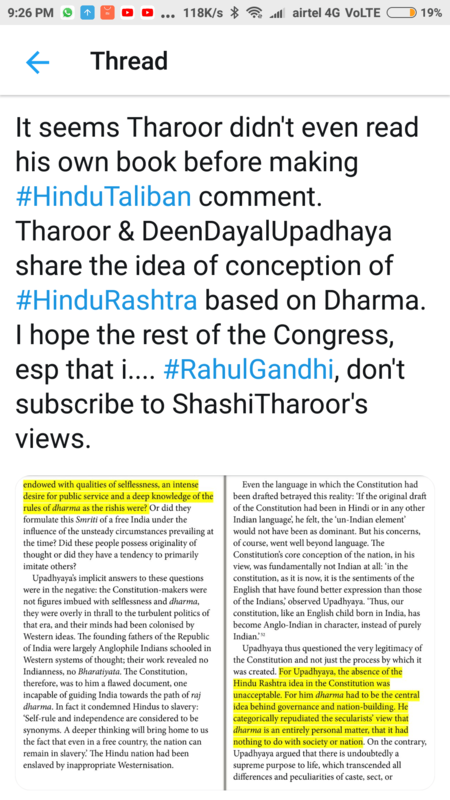 Tharoor may not be the representative thought on Hinduism in the Congress — in fact I know the Congress is majorly influenced by Kashmiri Saivism, of which the book tells almost nothing — but his is the only well articulated one at the moment. Moreover, he was deemed to have borrowed from the other influential Hindu voices in the Congress, which he has indeed done in reference to Gandhi, Radhakrishnan and Karan Singh. In the first part of the book, he has tried explaining Hinduism per se; in the second, he has dealt with Hindutva; and in the third, he has generally expressed the hope for the future. The core message of the book is that Hinduism is a pluralistic religion, which is being converted into a monolithic one by the Hindutva proponents, thereby attacking the very religion per se. He evidences pluralism by presence of various sects and praxis in Hinduism, which have outgrown Vedas/Upanishads and made the religion so tolerant and accepting as to even accept practices of Abrahamic religions; Islam, Christianity, and Judaism; into itself thereby grafting the pluralism of Hindu religion into the Indian constitution (my intrepretation, but let any smart journalist quiz him on this, and he will surrender). Let me state at the outset, I am alarmed. Why I am so needs some elaboration on my understanding of Hinduism. If one would read Dr. Radhakrishnan on Upanishads, one would learn Upanishads are the core of Hindu philosophy, which have been interpreted luxuriously by latter philosophers to derive numerous sects even standing in contradiction to each other. But all have survived because Upanishads are internally incoherent and ambiguous leading to several interpretations. In fact, Tharoor has not discussed all possible interpretations of Upanishads as animating various sects. He has more or less restricted himself to Vedanta interpretation, which by far is also the philosophical core of the Hindutva proponents in reference to Hindu religion per se. 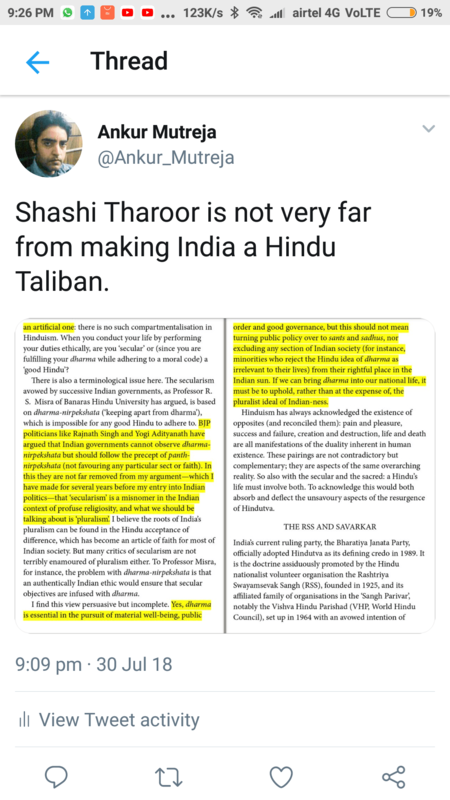 Thus there is hardly any difference between Tharoor and Hindutva proponents in the understanding of Hinduism. The difference is only in its practice. Hindutva proponents are militant practitioners and Tharoor is a mild practitioner. At the end of the book, he has shared an anecdote in which his IT friend compares Hinduism to an operating system, on which many applications have been developed, thus making a comprehensive integrated computing system. Unfortunately, Hinduism is just not that. Vedas and Upanishads have rather developed gradually over a long period of time like Linux but by developers who have not followed any programming rules or ethics. Nobody cares about Vedas anymore, for they were just ritualistic procedures, but Upanishadic philosophy has carried on to build many unrelated and even incompatible systems. So, yes there is pluralism, but it is not inherently cohesive and is vulnerable to attack from Hindutva proponents, who have transformed Hinduism, a religion, into a source of well-bound culture attractive for a nationalism school curriculum, where pluralistic Hindusim just doesn’t hold any appeal. But why am I alarmed? I am alarmed because Tharoor and Hindutva proponents are actually on the same train, it’s just that Hindutva proponents are running towards the engine thinking this will make their journey shorter. My problem is that the destination is same, of which I am ignorant. However, if I join the dots, I see a possibility of Hindu Rashtra even under the Congress rule. The basic requirement of Hindu Rashtra is the backdoor or front door entry of Dharma, a uniquely Hindu concept, in the Indian constitution. The Tharoorian Congress can not allow front door entry but won’t mind a back door one, for Dharma is deemed to be considered a proper and eligible candidate for determining national life by the Congress if the constitutional pluralism — known as secularism in law books — is maintained (I tweeted two pages from Tharoor’s book yesterday, the tweets are enclosed at the end of this review). But I claim that the idea of secularism in Indian constitution is nothing but grafting of pluralistic Hinduism into the Indian constitution (and for which I challenge any smart journalist to quiz Tharoor once again with the perspective that he is a Hindu reincarnation of some smart Congressi freedom fighter, who had access to drafters of the constitution). And if my claim is true, the backdoor entry of Dharma is also possible. But what is my problem with Dharma? Well…my problem is that I pretty well understand Dharma as deciphered from Gita, the holy book of Hindus, as a tool for propagation of slavery. Dharma is very simply speaking performance of one’s duty as decided by one’s nature in dedication to god sans any expectations in return. The nature is decided by god mostly manifested in the Varna system. In other words, one is required to surrender one’s individuality, self-determination and rights to the god’s system. In Gita, the god is Krishna, but in Vedanta, the god is an invisible abstract notion. So, in practice, in a nationalistic system, the ruling elites would become gods and enslave citizens/subjects in the name of Dharma. I agree there are other interpretations of Upanishads, so would be there of Dharma, but this is the dominating one. In the end, let me state this book is not a perfectly correct account of Hinduism, which I attribute strictly to Tharoor the politician. Tharoor has gone to the extent of calling Hinduism an individualistic religion to enhance its marketing appeal to the global audience, but of course it is not — Vedanta is certainly not; Patanjali Yoga does speak of personal God, but I have not read it much, and nor do I think Tharoor meant that when he spoke of Hinduism as a universal religion for he hardly spoke on Yoga in the book. Like Hindutva proponents, he has also included Buddhism, Jainism, Sikhism, and even Charvaka in Hindusim, which I find condescending — Charvaka was not even a religion; it was just Humanism. His intrepretation of Karma is also erroneous. He has linked it to achievement whereas the very concept of Karma repels achievement motive. It is a concept seeking renunciation of fruits of labour for attaining oneness with god. The failure to do so leads to re-birth, but the sacrifice done with right wisdom, i. e. sans expectations, leads to moksha. A word of advice to Tharoor: Choose a career because, but for politics, you are an amazing author. Be the first to comment on "Book Review of “Why I am Hindu” by Shashi Tharoor"